The Reformation in England further distanced the Irish, as the majority of Irishmen adhered stubbornly to their Catholicism. Eventually, in Elizabeth's reign, both sides resorted to the use of force on a large scale in a series of bloody wars and rebellions that were to culminate in the Earl of Tyrone's 'Great Rebellion' of 1595-1603. 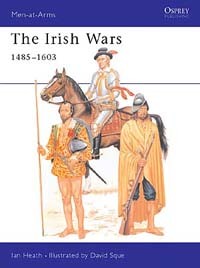 This text by Ian Heath looks at the history, organisation and tactics of the armies of the Irish Wars 1485-1603, armies which included such troops as the fearsome Irish Galloglasses, who bore a deadly axe six feet long with a blade one foot broad!